Gavin Rees said he had no answer to Adrien Broner's punching power that ended his bid to take the American's WBC lightweight title in Atlantic City. An uppercut floored Rees in the fourth round and the towel was thrown from the Welshman's corner after a body shot brought him to his knees in the fifth. "I knew he [Broner] hit hard, but his power just stunned me," said Rees, 32. "I got reckless and that was the end of the night, but I was always going to get back up." Rees, a former world light-welterweight champion, beat the count for the second time after Broner connected perfectly with his challenger's ribs at the Boardwalk Hall. But with further heavy blows landing in the final seconds of the fifth round, trainer Gary Lockett - himself a beaten challenger in a world title bout in Atlantic City - spared his man from more punishment. "I would have gone on until I was knocked out cold," stressed Rees, who suffered only a second defeat in a 40-fight career. "I disagree with Gary pulling me out, but he knows that I would have gotten hurt. We are good friends and he was just looking out for me." He added: "He's [Broner] the best I have ever been in [the ring] with. It's not a case of whether he will go on to be a super star... he is already there." 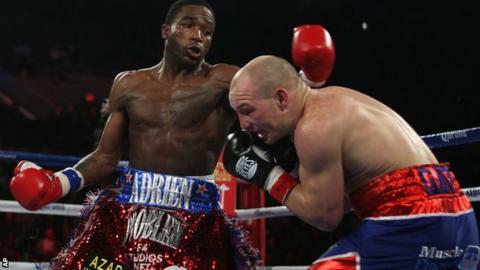 Victory for Broner extended the 23-year-old's unbeaten record to 26 fights, and paves the way for a unification showdown with Scotland's WBO title-holder Ricky Burns, who fights Mexico's IBF champion Miguel Vazquez on 16 March. "If I fought Ricky Burns, he would get burnt out," said Broner, who paid tribute to Rees's durability and pedigree as a "world-class fighter". "I want to fight him, but if he doesn't want to fight me, oh well. "There are high expectations for me to take boxing over after [Floyd] Mayweather and [Manny] Pacquiao hang up their gloves. "It was a nice fight. I have to go back and watch it. Overall I felt pretty. I just looked in the mirror and I still look good."